There are a lot of ­biennales in the world today. Too many. It takes a special chem­istry between location and contents to make a biennale work, and few of them have it. The best ones, I’ve noticed, seem to involve water. The best biennale in the world, the one in Venice, is set in a city that appears to have floated far away from reality. Whereas at Britain’s best biennale, the one in Liverpool, the huge presence of the Mersey seems both to connect you to everywhere else and to disconnect you. The moment the winds of the Mersey whistle that fierce sea shanty of theirs through your ears, you feel you have arrived somewhere piratical and different. It’s worth going just to hear someone say “All right” in that gorgeous, lilting Scouse accent, which turns every line of English into singsong. Liverpool does poetry really well, but it is no stranger to harshness, either, or to tragedy. I remember touring the venues for the first biennale, some of them still burnt-out — you could smell the smoke in them from the Toxteth riots years before. Track the rousing sea shanties back to their origins and you’re on a boat trans­porting slaves to the colonies. It is this darkness in the mix that gives this biennale its special character. So that’s the context, and context is half of every biennale’s presence. The other half, the art, has succeeded as well as it has here because someone took the excellent decision at the ­beginning to make this a ­conspicuously international event: a biennale that welcomes the world. Thus, at this seventh incarnation, you can watch a dogfight in Dagestan, presented on two wobbly video screens, by Taus Makhacheva, from the Caucasus. Or wonder why Jessie Kleemann, from Greenland, is standing naked in the sea, rubbing seaweed onto her breasts. The Faroe Islands are also represented, as is Iceland, in a section of the show described as the North Atlantic Pavilion, located in what was previously the Royal Mail’s main sorting office in the city. It’s a decrepit but exciting venue, and the intense way in which it interacts with the city’s social history is again ­typical of this event. Best of all, I had never previously heard of Makhacheva or Kleemann. These are not your typical biennale artists, whose names are embossed on busy Airmiles reward cards and who are sure to pop up soon at the Serpentine Gallery. These are international discoveries from unfamiliar places, true international artists whose work feels tangibly of its place, who take some searching out and who do not yet speak the ubiquitous art Esperanto that makes so many contri­butions to so many biennales feel so interchangeable. The theme this year is “Hospitality”. Congratulations to whoever came up with it. Biennales always have themes, and most of them are daft and unhelpful. But hospitality is a tangible idea that seems to plug into the character of the city and to resonate with important international implications. It is a particularly strong notion in the Middle East, and in the section of this show located in the old Cunard steamship headquarters — another fascinating and telling Liverpool venue — Mona Hatoum gives us a disjointed map of the world woven on an Afghan carpet, as well as an outline of Israel as proposed in the Oslo peace agreement in 1993, with the ­territories that should have been handed back to Palestine traced in red beads on bars of soap made from Palestinian olive oil. Hatoum is always an effective artist. Her contributions here speak in loud whispers of a hospitality betrayed. And the atmosphere of fractured Middle Eastern anxiety her doctored prayer mats bring to this event connects it by artistic zip line to every news broadcast of recent years. 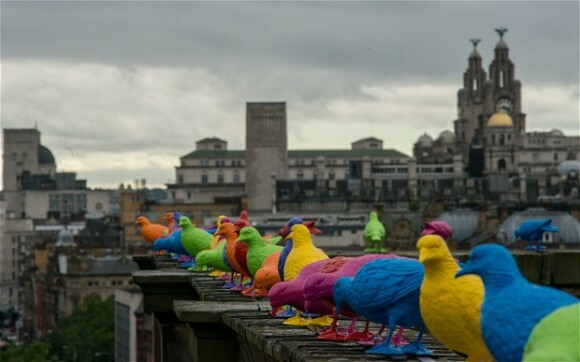 Bits of the biennial can be found all over Liverpool, and getting from one to the other is part of the fun. I came around a corner in the horrible shopping precinct that has been inserted into the centre of the city and found a large silver door blocking my way, with “VIP” written on it. It was put there by ­Elmgreen & Dragset, the same Nordic comedians who gave us the bronze rocking horse that is currently in Trafalgar Square. I pushed and pushed at this enti­cing VIP door, but it would not open. I wasn’t VIP enough. Nobody is. Deeper into the same shopping precinct, the Israeli artist Oded Hirsch has caused a full-size lift to crash out of the ground and loom above the shoppers. The unexpected arrival of Hirsch’s bulky lift seems somehow to rhyme with the intrusion of this horrible shopping precinct on the true fabric of Liverpool. As I said, hospitality is a good theme, and these are aspects of it explored in unpredictable ways. The main biennale exhibition, called The Unexpected Guest, is also set in the Cunard Building. This posh Merseyside palazzo, one of Liverpool’s famous Three Graces, was where you bought the tickets for a transatlantic crossing, and its ornate ticket offices — part ducal residence in Tuscany, part Dorothy Parker hotel — are the inspired setting for an intelligent selection of international art that riffs interestingly on the suggestive issue of the unexpected guest. Nadia Kaabi-Linke gives us a smart film installation in which a congregation in a church can be seen and heard answering the questions on a British visa ­application form as if they were being drilled by the Spanish Inquisition. “Have you ever been refused a visa for the UK?” the unseen preacher demands from the pulpit. “No,” answers the mixed-race congregation, in unison, as if chanting “Amen”. Kaabi-Linke is from Tunisia. Her neighbour in the show, Andrea Bowers, is from Los Angeles, and gives us an unexpected cast of video orators who sing and recite surprising texts for us. Thus, a slam-poet from Russia recites Marx’s Communist ­Manifesto in a noisy, slam-poet style that makes it feel disconcertingly contemporary, while a pregnant soprano sings out bits of the UN convention on refugees and succeeds in giving them the pathos of an opera. Bowers’s work is cunning and effective. But this is a biennale, so inevitably the good bits are followed by bad bits. The weakest contribution here is at Tate Liverpool, where a familiar selection from the permanent collection forces us to look at Gilbert & George, again, and Mark Wallinger, again. There are many good reasons to come to Liverpool, but seeing Gilbert & George, again, is not one of them. Next door to the Tate, the hippy-hoppy American film-maker Doug Aitken has had a special video pavilion designed for him by the world’s leading designer of video pavilions, David Adjaye. Inside, various heroes of the international ­creative community discuss the source of their creativity. I was struck by how much of the focus was on the speakers’ need to express themselves, and how ­little was on the substance to be expressed. Everyone wants to be heard; nobody is sure what they want to say. Welcome to the iWorld. At the Bluecoat, the hub of the biennial, John ­Akomfrah’s 45-minute film exploration of the personal history of the cultural theorist ­Stuart Hall darts this way and that across three screens simultaneously as it interlaces stories from Hall’s ­origins in Jamaica with bigger British histories of race and assimilation. Liverpool, of course, with its notorious colonial past, is a fully pertinent location for fingertip searches of these kinds of origins. Akomfrah’s three-part film was skilfully jigsawed and occasionally beautiful. But I’m afraid I fell asleep. Personal ­history is an iWorld speciality that can have a powerful nar­co­leptic effect on those whose ­history it isn’t. Two other shows deserve a mention. The John Moores Painting Prize, at the Walker Art Gallery, has been rewarding efforts in painting since 500BC. Or so it feels. It is usually the most boring event at the ­biennial. Bloomberg New Contemporaries, meanwhile, located in that same hastily converted sorting office, presents the best student work from around the country, and is usually useful and lively. This year, those roles are reversed. The John Moores is fresh and exciting. New ­Contemporaries is tedious beyond words. Don’t let that stop you. Cash-starved in places, as you’d expect in Olympic year, this is still a decent biennale with a decent theme. And any excuse to visit Liverpool is a good excuse. « Heroes of the Victorian avant-garde?